Popular illustrator and stamper Geninne Zlatkis has a passion for nature and colour that distinguishes her work. These 20 beautiful projects - including cards, an embellished journal and tote, and decorative wall pieces - provide the keys to Geninne's creative and image-making processes. 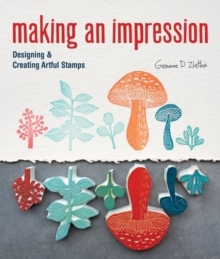 In addition to technique-specific primers with step-by-step photos of the essentials, Making an Impression includes 50 motifs showcasing Geninne's signature designs that crafters can copy and use for image transfers, stamp designs and collages.